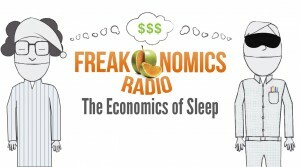 On this week’s episode of Freakonomics Radio, we continue last week’s conversation about the economics of sleep. We look at some research suggesting, for instance, that early birds really do get the worm. And then we look into the tactics — physical, mental, and strategic — of six-time hot dog-eating champion Takeru Kobayashi, who revolutionized the sport of competitive eating. What can the rest of us can learn from his breakthroughs? I'm a long-time Silicon Valley electrical engineer, and live in Santa Clara, California. Why would I have some familiarity with Huntsville, Alabama? I have no relatives there. Yet, I've visited several times. In contrast, I've never been to Amarillo. The reason I know something of Huntsville and nothing of Amarillo is that the former is the location of Marshall Space Flight Center. Among many other things, MSFC provides the International Space Station's design, assembly and support and also payload operations for all of NASA's manned and unmanned orbital missions. My experience of a number of neighborhoods in and surrounding Huntsville is that people connected either directly or in an ancillary way to the aerospace industry are literally everywhere you look. Through such employment, these people are compensated in a way commensurate with their skills, which are rare. Similarly, the number of technical workers of Huntsville with whom I'm acquainted who have partners also employed in this industry and so inhabit a household with two handsome incomes is substantially higher than in other parts of the region. In Amarillo, I suspect, the employment profile is somewhat less enhanced. Even were the conclusions promoted in this segment supported by other evidence - and they may well be - to suggest that a conclusion about how average household income may be materially affected by a forty or fifty minute daylight gradient, WITHOUT taking into account something as large as the prominent aerospace industry that surrounds one of the municipalities and that's absent from the other - without even mentioning it - is a feature of junky, clunky journalism and the junky, clunky fake science that programs such as _Freakanomics Radio_ now commonly provide. This Gladwellization of social science, where the emphasis of quirkiness and counterintuitivity and post-hoc reasoning and biased anecdote selection in service of some startling "click-bait" conclusion is routinely preferred to actual, mundane scientific inquiry, is a corrosive thing. It's K-rap, with a capital K.